Sweeter-than-sugar vanity toppers and a personalized hostess gift for this holiday season! Spotted: At Staples in Southington, Posh Puzzle Books in the flesh. PUZZLE ME THIS... There's no question about it, we love the Pocket Posh Puzzle books from The Puzzle Society and Andrews McMeel. 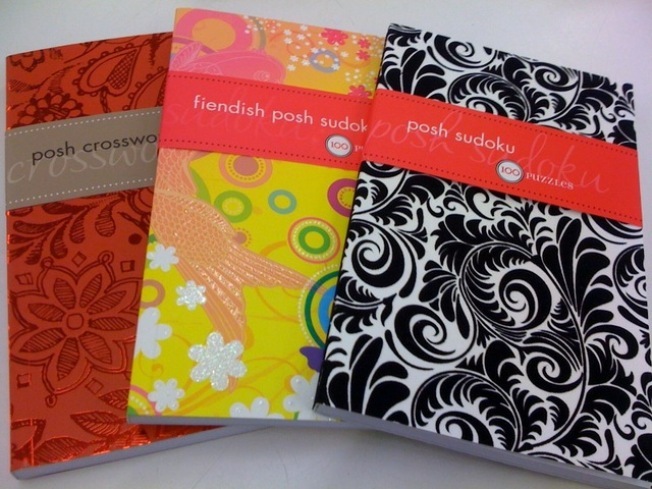 The Pocket Posh books come full of soduku, crosswords, word or logic puzzles and their label-less patterned covers appeal to the design lover in all of us. They look ever so chic when pulled out in the public eye but who knew for under $10 each, we could achieve beauty and brains too. Find in-store at Staples or order online. SWEET TOOTH... Little girls might naturally be sugar and spice and everything nice, but that doesn't mean we can't sweeten the deal. Pottery Barn Teen seems to see where we're coming from with their Sweet Treat Storage Holders ($19-$29.) Warning: the full set of stacking cupcakes and stash-ready pink donuts and cake slices are so adorable, they may cause tooth decay.